Methemoglobinization of diabetics blood with ethyl nitrite and hexyl nitrite. Citation: John Philip Tarburton. Methemoglobinization of diabetic’s blood with ethyl nitrite and hexyl nitrite. J Clin Endocrinol Res. 2019;1(1):24-28. The aim of this study was to assess the sensitivity of diabetics' blood to methemoglobinization compared to normal blood by ethyl nitrite and hexyl nitrite. Single factor ANOVA was calculated from the HbA1C values and the methemoglobinization times for ethyl nitrite and hexyl nitrite induced oxidations of 40 blood samples. A total of four groups were examined wherein n=20 for each group, i.e., group one consisted of ethyl nitrite treated type 2 diabetics blood; group two consisted of ethyl nitrite treated normal blood; group three consisted of hexyl nitrite treated type 2 diabetics blood; and group four consisted of hexyl nitrite treated normal blood. The blood samples used were identical for both of the nitrites employed in these studies. Thus for all the samples examined (n=80) an F value of 911.57 was calculated for these four groups which is greater than the F critical value of 2.73 so this means P<0.05. Post-hoc tests have revealed that the diabetics blood oxidation times differs significantly from normal blood (P<0.05). Data from all four groups (n=80) were used to get the best fit line Y=6.01-0.36X wherein X the independent variable=percent HbA1C and Y the dependent variable=methemoglobinization time in minutes. The standard error of estimate was 0.45 whereas the slope had an estimated standard error of 0.020. The coefficient of determination (r2) was found to be 0.86 which means that 86% of the total variation in y can be explained by the best fit line. This level of predictive acceptance is denoted as substantial. Because these nitrite esters differ only in the alkyl or R group attached to the ester this may well help to explain the high r2 value. In addition, this study demonstrates that a best fit line can be of good use to predict rates of hemoglobin oxidation times by these nitrite esters based solely on their HbA1C% value. It follows then that best fit lines based on empirical data are valuable tools to predict methemoglobinization time based just on HbA1C values for any alkyl nitrite. Alkyl nitrites (formally known as alkyl esters of nitrous acid) are compounds that have a distinctive fruity odor. Examples of them include compounds such as ethyl nitrite, butyl nitrite, pentyl nitrite and hexyl nitrite. These aforementioned esters have been shown to induce the rapid oxidation of oxyhemoglobin into methemoglobin [1-3]. The clinical significance of this reaction is that the compounds cause the iron in hemoglobin to lose one electron which means that the hemoglobin molecule can no longer transport oxygen thereby rendering it useless to the body [4,5]. Any number of nitrite esters such as ethyl nitrite, propyl nitrite, butyl nitrite, pentyl nitrite and hexyl nitrite are used as inhalants known as poppers . They are easily obtained  and overuse can cause side effects such as tachycardia, migraine headaches, fainting and dizziness . Isopropyl nitrite poppers can cause maculopathy [9-11]. Collectively, it has been discovered that alkyl nitrites may induce neurotoxicity which mainly impacts learning and memory function . If swallowed poppers can cause cyanosis followed by death due to too much methemoglobin because the hemoglobin can no longer transport the amount of oxygen required by the tissues which is a condition referred to as acquired methemoglobinemia [13-15]. Ingestion of sodium nitrite has led to fatal methemoglobinemia . Because of the wide usage of these nitrite esters for recreational consumption coupled with side effects arising from their use a comparative study of diabetics blood vs. normal blood appears warranted [17-21]. The goal of these studies is to help establish that people with type 2 diabetes mellitus have a greater risk of enhanced methemoglobin formation by alkyl nitrites compared with normal (non-diabetics) blood. If statistical methods can be employed to identify the 'at risk' group, e.g., diabetics, by using single factor ANOVA followed by the requisite ad hoc statistical tests including linear regression analysis and the coefficient of determination calculation, then this would provide supportive reasons to indicate that alkyl nitrite use in any form should be avoided for diabetics. Sigma-Aldrich Chemical Company was used as the supplier for ethyl nitrite. Fisher Scientific was the supplier used for hexyl nitrite and other needed chemicals (i.e., for solutions, solvents, cleaning, etc.) Adult blood samples were obtained from Physicians Plasma Alliance (PPA) which included 20 normal and 20 Type 2 diabetic blood samples. The procedures followed by PPA for this sample collection study were in accordance with the ethical standards of the Hummingbird IRB Protocol wherein all subjects used in these studies gave voluntary informed consent. These blood products were all tested and found to be negative for antibodies to HIV 1/2 and HCV and are certified to be non-viral by a FDA licensed testing facility. Acid-Citrate- Dextrose tubes were used for blood drawing and were stored at 2-4°C. Quantitative measurement of HbA1C present in the blood samples was done with a Bayer DCA-2000 analyzer wherein HbA1C (%) ≥ 6.5 is classified as Diabetes Mellitus . Measurement of methemoglobin formation was done with a Thermo Scientific Genesys 10S UV/VIS Spectrophotometer. Blood samples obtained from PPA were centrifuged for 20 min at 2000 g at ambient temperature to allow for removal of the plasma. The remaining packed cells were then aerated by vortexing and washed in phosphate buffer at pH 7.2. Centrifugation and washing were repeated twice more with the aforementioned buffer. The red cells were then resuspended in pH 7.2 phosphate buffer and stored for a maximum of 60 min prior to testing. Red cells in the suspension were lysed wherein 0.01 mL of them was added to 1.0 mL of distilled water. The final volume was adjusted to 2.6 mL by the addition of pH 7.2 phosphate buffer. An absorbance of A=1.0 ± 0.2 at λ=436 nm was ordinarily obtained which constituted the baseline oxyhemoglobin absorbency value range for these methemoglobinization experiments. Ethyl nitrite (or hexyl nitrite) which had been diluted to strength of 0.1% in ethanol solution was prepared as a stock solution. A 0.05 mL aliquot of one of these stock solutions was then added to the aforementioned hemoglobin solution and was then placed in a cuvette. (Note: Ethyl nitrite=38 μM and hexyl nitrite=138 μM) and the final hemoglobin concentration was approximately 10 μM ). The Genesys spectrophotometer set at λ=436 nm has a built in chart recorder which generated an inverted S curve as the oxidation of oxyhemoglobin into methemoglobin reaction proceeded to completion. A final asymptotic phase which is indicative of 100% methemoglobin formation gave a final absorbency range of A=0.5 ± 0.1. For the samples studied the methemoglobinization times (MT) obtained appear in Table 1. Table 1: Hemoglobin A1C & Methemoglobinization Times of Blood Samples. Single factor ANOVA is an appropriate test to use for these data when all four groups, i.e., ethyl nitrite treated type 2 diabetics blood, ethyl nitrite treated normal blood, hexyl nitrite treated type 2 diabetics blood and hexyl nitrite treated normal blood, are being examined simultaneously. The significance level has been considered to be P<0.05. Ad hoc requisite tests performed included a single linear regression line with error bars and calculation of a coefficient of determination. The appropriate tests to employ for these samples are the coefficient of determination and linear regression analysis. All the aforementioned data were analyzed using Excel spreadsheets on a Microsoft computer . The normal samples (1N-20N) were assessed as non-diabetic because HbA1C values of <6.5% were obtained. Diabetic samples (1D-20D) all had HbA1C values >6.5%. Student's t-test for independent samples has revealed that the HbA1C values vary significantly between these two groups (P<0.05). Results from the independently performed ethyl nitrite and hexyl nitrite studies used identical blood samples and the t-test revealed that in aggregate the methemoglobinization times were significantly shorter for the diabetic patients' blood (P<0.05) . Single factor ANOVA results including the sum of the squares, degrees of freedom (df), mean square values, F value and the critical F value (Fcrit) are all presented in Table 2. The F value was calculated to be 911.57 so P<0.05 since this is far greater than Fcrit value of 2.73. This implies that these four groups are likely to belong to totally different populations, i.e., diabetic vs. non-diabetic, because we can now reject the null hypothesis. Table 2: ANOVA: Single Factor. The idea behind using regression analysis is to find out if a set of predictor variables, i.e., HbA1C values, do a satisfactory job in predicting outcome variables, i.e., methhemoblobinization times. For the pair of studies undertaken simple linear regression analysis was done with HbA1C as the independent variable (X) and methemogloniization time as the dependent variable (Y). Using the data in Table 1 the best fit line Y=6.01-0.36X was calculated and is illustrated in Figure 1. The standard deviation of points around the fitted line was 0.45 and the standard errors of the slope and intercept were 0.020 and 0.204, respectively. In addition a coefficient of determination (r2) which ranges from 0 to 1 was calculated from the regression line and was found to be 0.86. This then yielded a correlation coefficient of r=-0.93 calculated by taking the square root of r. Due to fact that methemoglobinization times vary inversely with HbA1C percentage a negative correlation between these variables exists. Not only is sensitivity of methemoglobinization by these alkyl nitrite raised in diabetes blood but in addition methemoglobinization times can now be calculated by the formula Y=6.01-0.36X. The slope, Y/X, becomes smaller on average by 0.36 minute per 1% increase in HbA1C. Calculation of the 95% confidence limits on the slope gave values that varied from -0.32 min to -0.40 min per % HbA1C. Because all the data points obtained occur at values far greater than a HbA1C value of zero any calculation of a Y intercept would involve a substantial extrapolation of this best fit line. Therefore, an accurate calculation of the Y intercept cannot be done with experimental accuracy for these data. To obtain an accurate Y intercept one would have to perform methemoglobinization studies on blood samples with negligible amounts of HbA1C. Major uses for regression analysis include determining the strength of predictor variables (the independent variable) as it applies to the outcome or dependent variables. The coefficient of determination obtained (r2=0.86) indicates that the predictor variables are good in forecasting the susceptibility to methemoglobinization of blood by these alkyl nitrites. For example sample 2N from Table 1 with a HbA1C=5.1% had observed methemoglobinization times of 5 min and 4 min with ethyl nitrite and hexyl nitrite, respectively, compared to a calculated methemoglobinization time of 4.2 min. Indeed these experimental values appear quite close to the calculated value. Likewise, for sample 8D with a HbA1C=12.2% the observed methemoglobinization times were 1.9 min and 1.8 min with ethyl nitrite and hexyl nitrite, respectively, compared to a calculated methemoglobinization time of 1.6 min. Once again the experimentally obtained values are very close to those values calculated from the best fit equation of Y=6.01-0.36X. For r2 values 0.67, 0.33 and 0.19 in the PLS models are considered substantial, moderate and weak, respectively . (Note r2=1 defines perfect accuracy.) Therefore, the finding of r2=0.86 would therefore imply an accuracy of somewhere between substantial and perfect. Therefore the r2 value of 0.86 has at least exhibited a substantial (or even greater) level of accuracy. Earlier work by Moussa  proposed the idea that metabolic differences between Type 1 diabetes mellitus and Type 2 diabetes mellitus caused an enhanced sensitivity to methemoglobin formation in the former group. However, the present findings on Type 2 diabetic’s blood have clearly demonstrated an enhanced sensitivity to methemoglobin formation in Type 2 diabetic’s blood as compared to those of non-diabetics (P<0.05). Bivariate correlation analysis yielded r=-0.93 for the experimental data obtained in these studies. The variables studied, HbA1C% and methemoglobinization time, are contrary variables. This means these variables move in opposite directions and this is known as negative correlation wherein r=-0.93 indicates a strong negative linear relationship between these two variables. Noteworthy also is the fact that these product moment correlation coefficients are in good agreement with r values found for butyl nitrite and amyl nitrite in an earlier study . Naturally when the r value is squared one obtains the coefficient of determination (r2) of 0.86 which implies a substantial correlation between the variables. This supports the fact that the linear equation that was obtained allows for a more quantitative prediction of how long the oxidation reaction takes. Noteworthy also is the fact that for the Type diabetic 2 blood samples used in these studies (vs. normal blood) they have a statistically significantly higher percentage of HbA1C (P<0.05) which implies through the straight line equation Y=6.01-0.36X that their oxidation times are significantly shorter than in normal blood (P<0.05) . As elucidated in this study Type 2 diabetics blood have significantly shorter methemoglobinization times for both ethyl nitrite and hexyl nitrite (P<0.05). Moreover, this is reinforced by earlier studies that other alkyl nitrites such as butyl nitrite and pentyl nitrite gave equivalent results [19-21]. These similar findings could be attributed to the fact that these nitrite esters differ only in the type of alkyl group present. Moreover, this study demonstrates that linear or Y=mx+b equations can be useful in predicting rates of hemoglobin oxidation times by these nitrite esters based solely on their HbA1C% value. It follows then that such equations could be used to forecast methemoglobinization times of individuals based only on their HbA1C values for any given alkyl nitrite. Moussa found that methemoglobin formation by autoxidation was significantly higher from HbA1C than from the nonglycated HbA0 . After the glycosylation of HbA0 occurs the end product of this irreversible rearrangement reaction yields a permanently altered molecule known as HbA1C which has been reported to be a less stable molecule than HbA0. Compared to HbA0, HbA1C undergoes faster autoxidation . In addition glycation of hemoglobin results in modifications of this molecule. Namely, the alpha helix content is reduced and more tryptophan residues become accessible to the surface. This results in increased thermolability as well as weakened heme globin linkages in HbA1C vs. HbA0. FTIR spectral analysis revealed elevated HbA1C levels caused secondary structural modifications that led to decreased structural stability in diabetics whose HbA1C was ≥ 9.0% .These changes are reported to lead to enhanced oxidative stress in diabetics. Naturally, an X-ray crystallographic study of HbA1C would be able to confirm that these structural modifications have occurred wherein preliminary studies have now been undertaken . 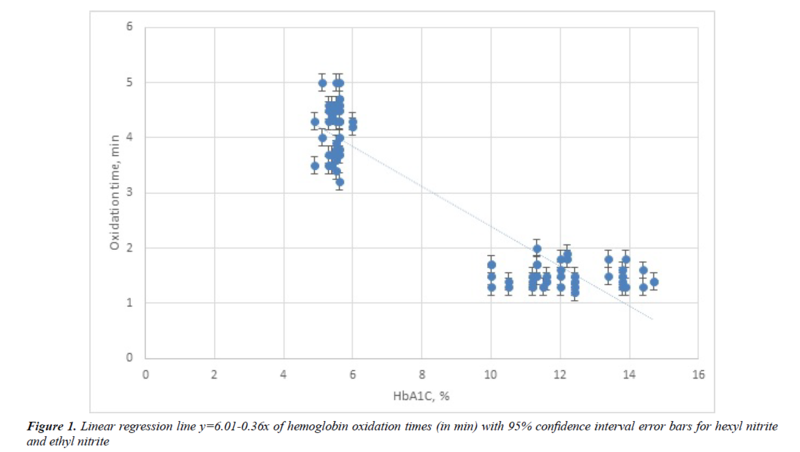 The present study shows a statistically significant negative correlation between methemoglobinization time with HbA1C values for diabetics blood vs. normal blood (P<0.05). This implies that methemoglobinization is an important indicator for oxidative stress in diabetic’s blood and makes any use of alkyl nitrites to be avoided by diabetics since their blood more easily undergoes conversion from oxyhemoglobin to methemoglobin than with non-diabetics. The strength of these findings are that to they apply to human blood samples of diabetics and normal individuals, i.e., the in vitro findings are clear cut; however, this does not necessarily prove these findings would be the same in vivo. Kiese M. Methemoglobinemia: a Comprehensive Treatise: Causes, Consequences, and Correction of Increased Contents of Ferrihemoglobin in Blood. CRC Press. Cleveland, Ohio. 1974. Doyle MP, Pickering RA, DeWeert TM, et al. Kinetics and mechanism of the oxidation of human deoxyhemoglobin by nitrites. The Journal of Biological Chemistry. 1981;256:12393-8. Faley B, Chase H. A Case of Severe Amyl Nitrite Induced Methemoglobinemia Managed with Methylene Blue. Journal of Clinical Toxicology. 2012;2:127. Longo D, Fauci A, Kasper D, et al. Harrison's Principles of Internal Medicine. 18th ed. Vol. 1 McGraw Hill, New York, NY, 2012, pp. 857-8. Blanco A, Blanco G. Medical Biochemistry. First ed., Elsevier, 2017, chapter 3. Beck F, Guignard R, Richard JB. Poppers at top: Alkyl nitrites use in France [Abstract]. Medicine Sciences (Paris). 2014; e30, 916-21. Romanelli F, Smith KM, Thornton AC, et al. Poppers: Epidemiology and Management of inhaled nitrite abuse. Pharmacotherapy. 2004;24(1):69-78. Davies AJ, Kelly SP, Bhatt PR. 'Poppers maculopathy'-- an emerging ophthalmic reaction to recreational substance abuse. Eye (correspondence). 2012;26:1479-86. Rewbury R, Hughs E, Pubrick R, et al. Poppers: Legal highs with questionable contents? A case series of poppers maculopathy [Abstract]. Brititsh Journal of Ophthalmology. 2017;101. Davies AJ, Borschmann R, Kelly SP, et al. The prevalence of visual symptoms in poppers use: a global survey. BMJ Open Ophthalmol. 2017;1:e000015. Cha HJ, Kim YJ, Jeon SY, et al. Neurotoxicity induced by alkyl nitrites: Impairment in learning/memory and motor coordination. [Abstract] Neuroscience Letters. 2016;619:79-85. Bernasconi B, Konrad CJ, Fischer S. Case Report - A dangerous intoxication after ingestion of alkyl nitrite ('poppers'). Anästhesiol. Intensivmed Notfallmed Schmerzther. 2014;49:654-8. Hall A, Stessel B, Bergmans D, et al. Two cases of acquired methemoglobinemia. Acta Anaesth. Belg. 2012;63:97-100. Wong A, Koutsogiannis Z, Greene S, et al. A case of hemolysis and methemoglobinemia following amyl nitrite use in an individual with G6PD deficiency. Journal of Acute Medicine. 2013;3:23-5. Nishiguchi M, Nushida H, Okudaira N, et al. An autopsy case of fatal methemoglobinemia due to ingestion of sodium nitrite. Journal of Forensic Research. 2014;6:262. Tarburton J. Amyl nitrite induced hemoglobin oxidation studies in diabetics and non-diabetics blood. J Diabetes and Metabolism. 2013;4:258-60. Tarburton JP. Hemoglobin oxidation studies in diabetics blood comparing the effect of sodium nitrite vs. amyl nitrite. Diabetes Research and Treatment. 2014;1:112-7. Tarburton JP. Hemoglobin oxidation studies in diabetic’s blood and normal blood: The effects of butyl nitrite and pentyl nitrite. Diabetes Research and Treatment. 2015;2:127-37. Tarburton JP. Linear regression analysis and correlation findings in hemoglobin oxidation studies in diabetic’s blood and normal blood: The effects of butyl nitrite and pentyl nitrite. Diabetes Research and Treatment. 2016;3:134-42. Tarburton JP. Comparative studies on the effects of ethyl nitrite and hexyl nitrite induced hemoglobin oxidation of diabetic’s blood and normal blood. ARC Journal of Diabetes and Endocrinology. 2017;3:1-5. World Health Organization (WHO). Use of Glycated Haemoglobin (HbA1c) in the Diagnosis of Diabetes Mellitus Abbreviated Report of a WHO Consultation. Geneva: WHO; 2011. Weissbluth M. Hemoglobin: Cooperativity and electronic properties. In: Kleinzellar A, Springer GF, Whitman HG (eds), Molecular Biology, Biochemistry and Biophysics, Vol 15 Sringer-Verlag, New York, 1974, pp. 136-41. Colton T. Statistics in Medicine. Little, Brown and Co. Boston, MA, 1974, pp. 99-150 and 207-11. Chin WW. The partial least squares approach to structural equation modeling. In: Marcoulides GA (editors), Modern Methods for Business Research. Mahwah, NJ: Lawrence Erlbaum Associates, 1998, pp 295-358. Moussa SA. Oxidative stress in diabetes mellitus. Romanian J Biophys. 2008;18:225-36. Moussa SA. Biophysical changes in red blood cells and hemoglobin components of diabetic patients. Journal of Genetic Engineering and Biotechnology. 2007;5:27-32. Sen S, Kar M, Roy A, et al. Effect of nonenzymatic glycation on structural and functional properties of hemoglobin. Biophys. Chem. 2005;113:289-98. Ye S, Ruan P, Yong J, et al. The impact of the HbA1c level of type 2 diabetics on the structure of haemoglobin. Sci. Rep. 2016;6:33352. Syakhovich VE, Sarawathi NT, Ruff M, et al. Crystallization and preliminary crystallographic analysis of human glycosylated hemoglobin. Acta Crystallogr Sect F Struct Biol Cryst Commun. 2006;62(Pt 2):106-9.